We spent 4 months in Bali in the last half year alone. During this time, the island became our very personal sanctuary. Bali has been the place to go for what feels like 30 years. You either meet people who have already been or people who really want to go. Sara and Marco write about traveling as a couple on their travel blog Love and Compass. And rightly so! Even though certain parts of Bali have become extremely touristy, it’s still managed to retain its very special and magical flair. When you see the huge rice fields or watch a Hindu ceremony for the first time, you can’t help but fall madly in love with this island. To make your Bali trip as special as possible, we’ll let you in on 8 secret spots off the beaten track that many Bali travelers haven’t even heard of yet. 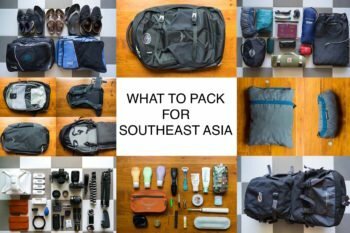 You can find even more practical Bali tips at the end of the post. 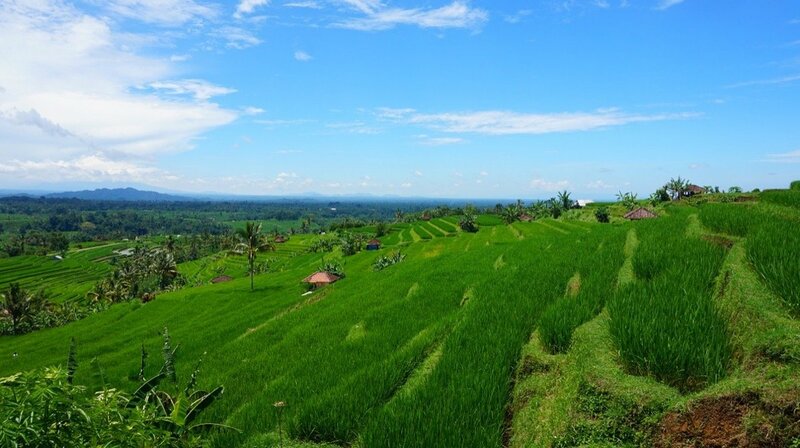 The Jatiluwih rice terraces are among the largest rice terraces in Bali and are much less widely known than the extremely popular and overrun Tegalalang rice terraces. It’s really unbelievable, there are rice plants as far as the eye can see. Much greener than you could ever imagine. As it someone added an extra green layer to the landscape with Photoshop! It gets a bit more crowded here in the main season, but the area is so extensive that it’s just a drop in the bucket. 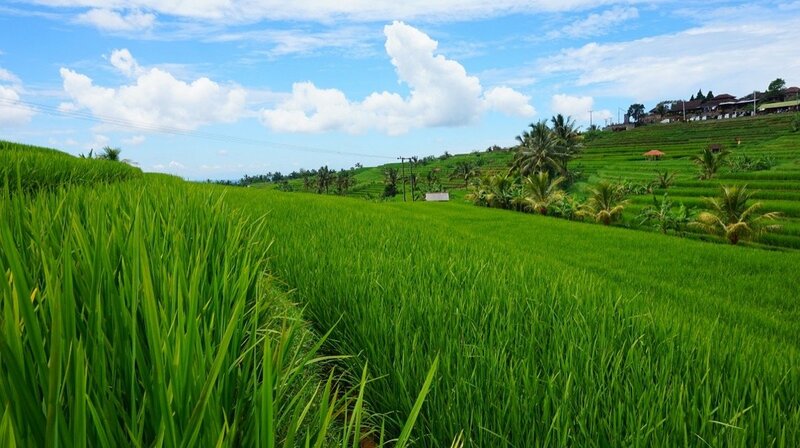 You can walk down a small and narrow hiking trail and stroll right through the rice plantations while you enjoy the breathtaking view. And we probably don’t even need to mention that you can find what feels like two million photo motifs around here. 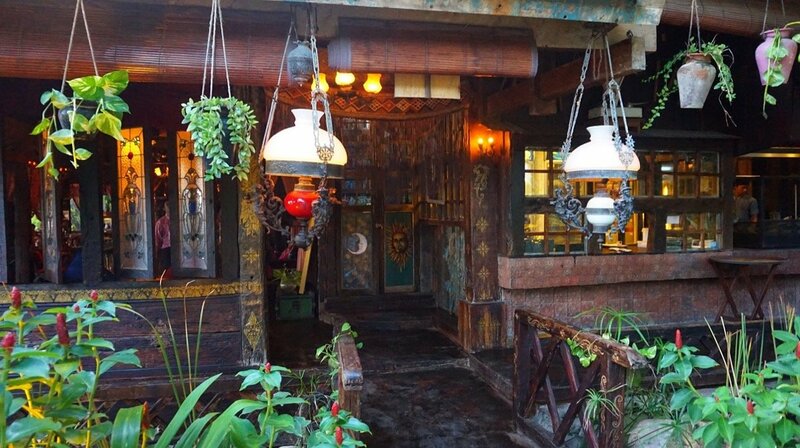 Believe it or not, the Bali of yesteryear is still alive today. Of course not in the more well-known areas in the south and not as pure as it once was. Bali has simply become way too advanced for that in recent years. Nevertheless, you can still find lots of areas that aren’t completely built up where you can still feel the typical Bali flair. Our personal favorite is Amed – we fell head over heels in love right from the get-go. It’s by far the most diverse and in our opinion the most beautiful place on the entire island. 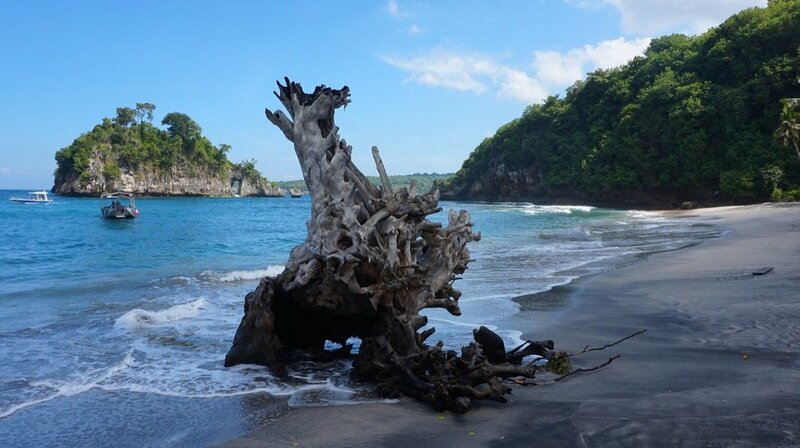 Amed is located in the east of Bali, right by the sea. 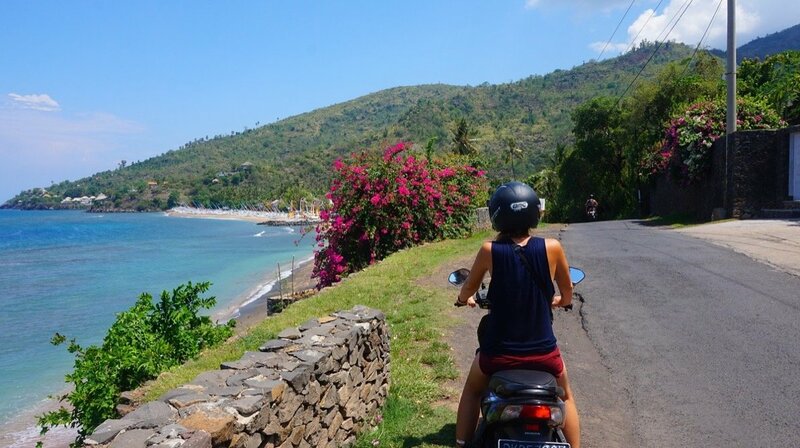 It has everything you imagine when you think of Bali: Beautiful sea, beaches with light and dark sand, superb snorkel spots, vast rice terraces, countless mountains, and a coastal road perfect for scenic scooter rides. The area is mainly known as a hot spot for diving. There aren’t any parties here. No masses of tourists either. 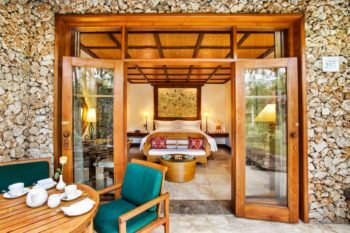 Instead, you’ll find peace, relaxation, and a side of Bali that you can’t help but fall in love with! The town of Amed is definitely a Bali secret spot that you should remember for your next Bali vacation! 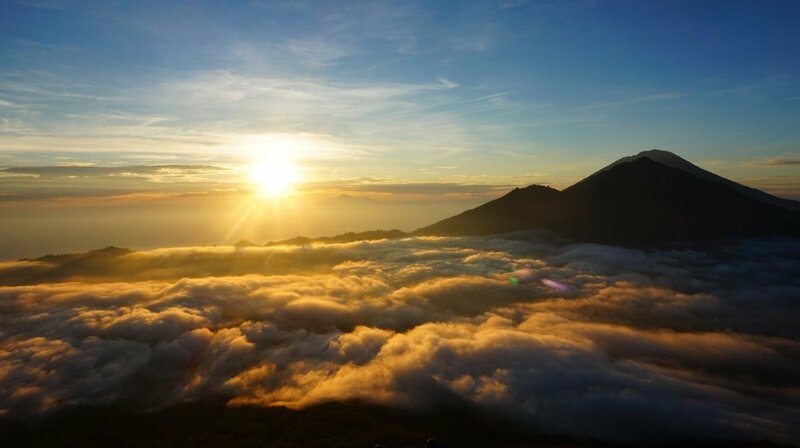 This spot isn’t really that much of a secret anymore, but it’s definitely one of the must-dos on any Bali trip: Hiking up the Mount Batur volcano in time for sunrise. For Sara and me, it was one of the most breathtaking and beautiful experiences of our lives. 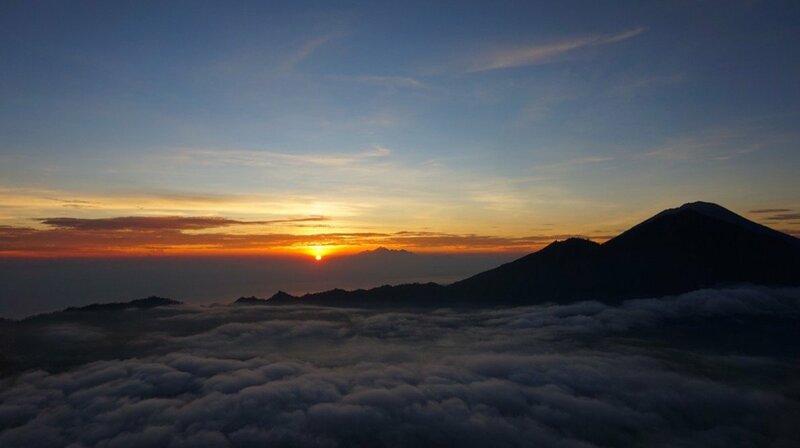 When you see the sun rising on the horizon while standing at a height of over 1600 meters and you can even see Lombok off in the distance, you’ll wish that moment would never end. However there are two minor ‘drawbacks’: The adventure already starts between 1 am and 2 am at night. That means you’ll have to get up very early. Then a driver will pick you up at your accommodation and take you to the volcano, followed by a 1 ½-hour trek up the volcano. The hike gets quite strenuous and steep towards the end. But believe us, it’s 10 times worth the effort! Our tip: Take warm clothes and a change of clothes. It gets pretty cold at the summit, between 15 and 20 degrees Celcius. You’ll also be drenched with sweat. Just the kind of situation where a dry set of clothes is a real blessing. 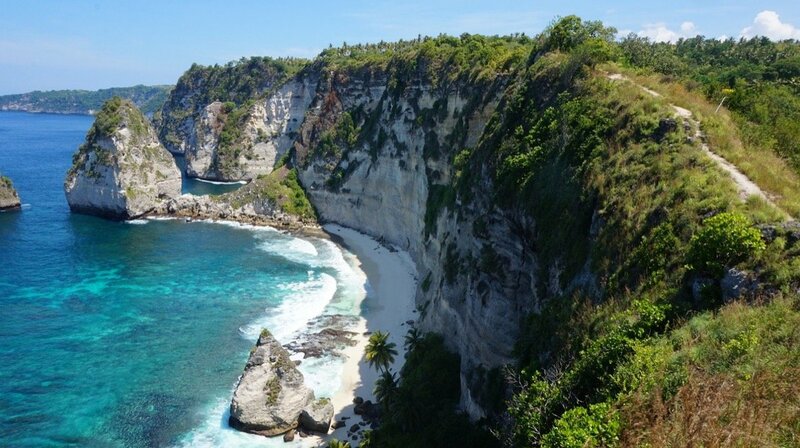 A secret spot par excellence: The island of Nusa Penida! It’s just 30 minutes away from Bali by fast boat and is located right next to Nusa Lembongan. Although Nusa Penida is 25 times larger than its smaller neighboring island and has a thousand times more to offer, the tourism industry there is still completely in its infancy. Currently you can count the the number of accommodations on a couple of hands, and only few travelers stray onto this island. You can truly experience the authentic spirit of Indonesia up close here! Children who meet you with a big grin on their faces and old folks who stare at you as if you’re were the first Westerner they’ve ever seen in their lives. One of the island’s many highlights: The over 200-meter-high cliffs. One of the most beautiful views on the planet. 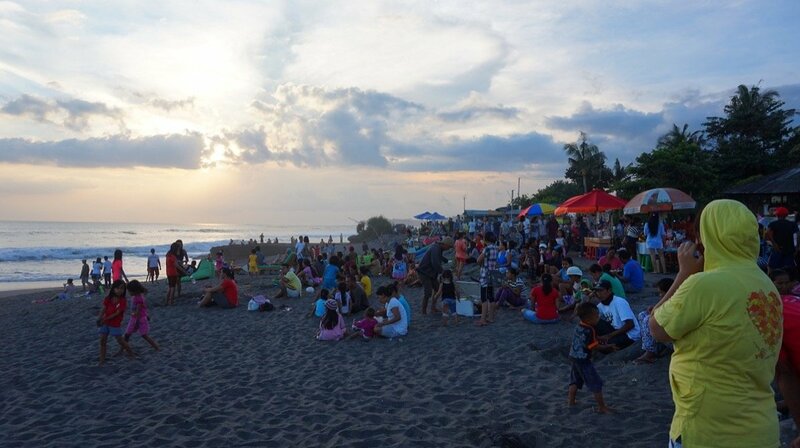 Every Sunday at Pererenan Beach in Canggu, locals from the surrounding area gather to see off the week at the beach with a beautiful sunset. There are some small warungs (food stalls with local food), balloons are handed out to the kids, and chilled beverages are sold. Everywhere you see kites rising in the air, Indonesian families bathing in the sea, and dozens of dogs playing in the sand. Sunday evening at Pererenan Beach is simply something to behold. The beach suddenly comes to life and you can experience a taste of the local way of life up close. It all starts at around 5 pm and ends just after sunset. Do you want to try something really unhealthy, extremely sweet, but incredibly delicious? Then a sweet martabak is just the thing you’re craving! Usually we don’t really have that much of a ‘sweet tooth’ ourselves, but we’ll always gladly make an exception for martabak. But what is a martabak? Think of it as an extremely thick pancake covered with chocolate sprinkles, milky cream, and peanuts and then folded. A taste explosion in your mouth and extremely cheap. The sweet temptation only costs around 10,000 – 15,000 rupiah (about 0.70 – 1 euro) at the small street stalls. 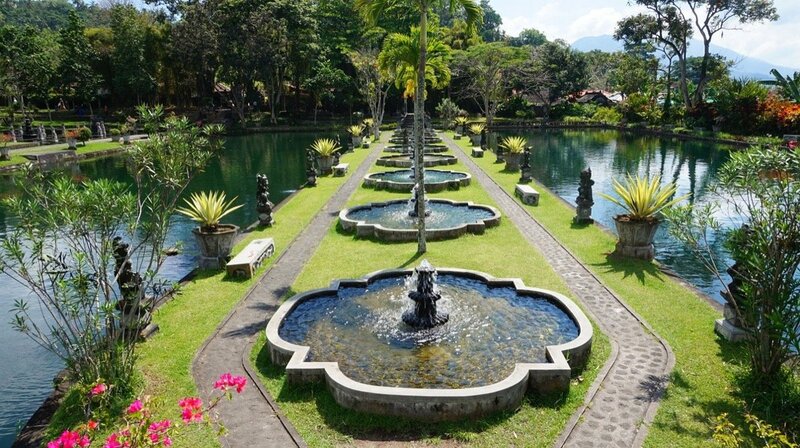 The Tirtagangga Water Palace is one of our sightseeing highlights in Bali. It’s pretty large and extremely well maintained. 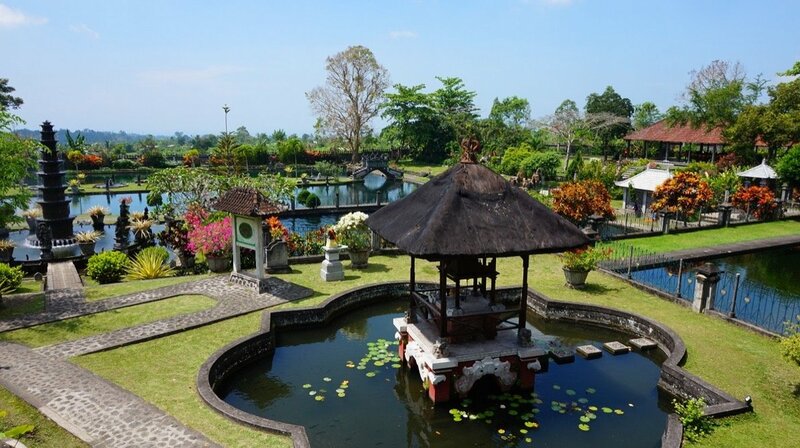 It features the most colorful flowers, large water basins with thousands of fish, and lots of typical Balinese sculptures and statues. Tirtagangga is a real oasis of calm and well-being! You should also make sure to pack your bathing gear. Because the water palace has two swimming pools available for public use. One for men and one for women. Since the Tirtagangga Water Palace is relatively far away from the other major destinations, it usually isn’t that crowded. In fact, if you arrive before 10 am in the morning, you’ll probably only encounter a couple of locals. And that’s it. It fills up a bit by noon though. 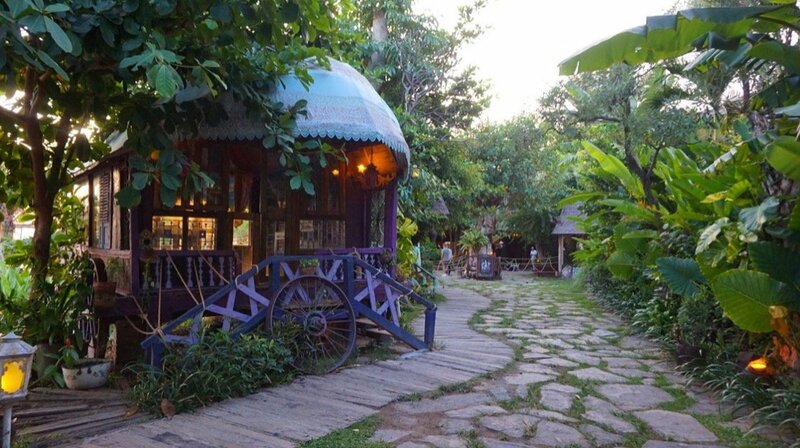 There are many unique restaurants in Bali. We’ve seldom seen an island with such an incredible selection of special places to eat as here. But even among such illustrious company, La Laguna in Canggu still stands out. Calling it a restaurant is actually kind of an understatement. It’s more of a museum where you can eat. 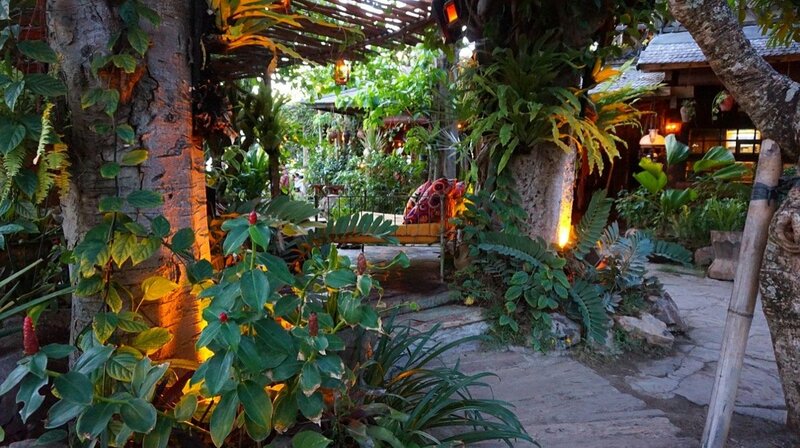 La Laguna was modeled after a gypsy village and done up beautifully. The entrance area with its gypsy caravans is already a world-class sight to behold. And don’t even get us started on the beautiful lawn sprinkled with seating cushions and the stunning interior design. Everything just looks perfect and delightful. Just take a look at the pictures. However the food at La Laguna is definitely in the upper price range, at least by Bali’s standards. But the food there is incredibly delicious! 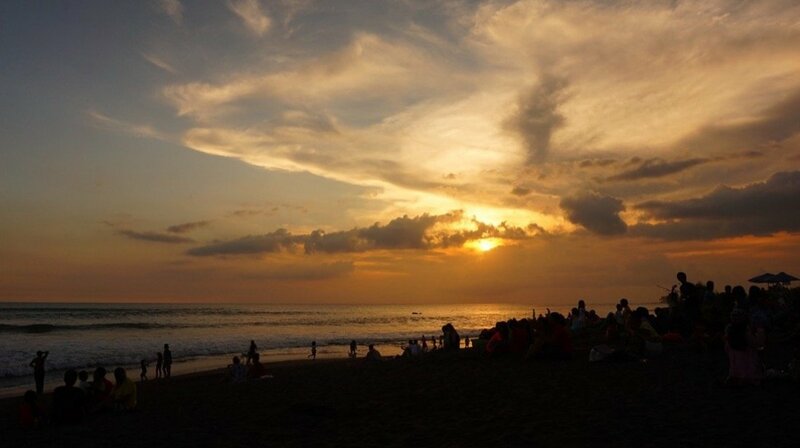 Those were our very personal tips for your Bali vacation! Oh, and by the way: You can also find us on Facebook and Instagram. Just drop by and leave us a ‘like’! 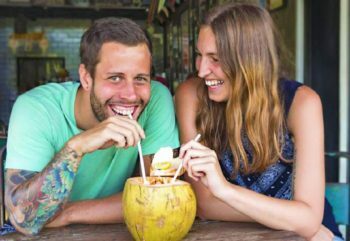 Now that Sara and Marco have shared their amazing secret spots off the beaten track for your trip to Bali, we’d like to give you a few more practical tips. Although we aren’t surfers, we felt right at home here. Clean, good rooms, a pool and a bar on the roof, and just a few minutes walk from the sea. A small café with an amazing vegan breakfast and the best pancakes I’ve ever tasted in my life. Not far from the our hotel Koa D Surfer you can find One Eyed Jack, one of the best Japanese restaurants we’ve ever been to. Not that cheap, but delicious food at its finest. Not a luxury accommodation, but nevertheless one of the coziest and best places we’ve ever stayed. Five bungalows built around a pool, run by a really lovely German woman married to a Bali native. The staff take great care of their guests and the complex, and the generous breakfast by the pool is so good, it’s worth traveling to Gili Air just to try it. Oh, and the sea is exactly 1 minute away –– on foot of course.